This is our company where construction activities are conducted from. Our focus is, inter alia, construction, service, maintenance and construction on facilities related to water. In this area we offer kompletta- or installments relating to, inter alia, harbors, wharves, piers, lighthouses, bridges, power plants, etc. Through a unique and longstanding partnership with various construction and management companies, we can offer you a broad knowledge in these areas. Our special services targeting ships and the merchant will also be conducted in this company. Through our offices in Stockholm, Gothenburg, Malmö, Ängelholm, Sölvesborg, Kalmar and Harnosand we can give our customers fast start-ups and achieve optimal results. We are one of the oldest companies in the Sjöentreprenad, Dykeri and Marine Service. Since the end of 60 century, we have performed works of all sizes, as well as been a service partner to shipping, shipbuilding, municipalities, power and process industries. 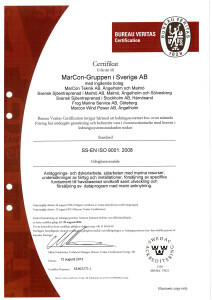 The ownership structure has shifted over the years, today included SSE Marcon The group has its headquarters in Angelholm, Marcon Group is also the owner of Stockholm Water Works AB, Stockholms Vattenentreprenader AB (SVENTAB), Bogserteam Öresund AB, Marcon Teknik and Marcon Windpower AB. We shall strive for continuous improvement in a long term relationship with our customers and contribute to sustainable development for the benefit of people, the environment and cultural heritage. We should be the natural partner for professional purchasers water operations. Experience from both customers and ourselves to be systematically returned, to create competitive, flawless products and good working environment.